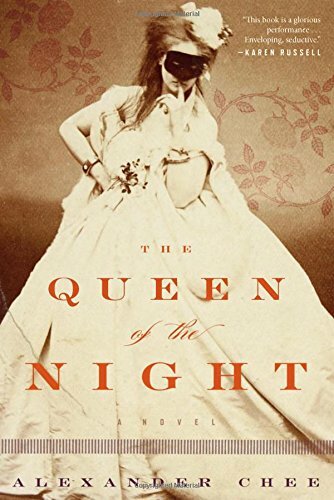 The Queen of the Night will be most enjoyed by those who have a working knowledge of 19th century French history, love opera, and have the patience and endurance for long books. The thing is, I’m not sure how many people fit the intersection of those three criteria. It’s a club for which I personally do not have a membership card. The novel is certainly an achievement, evidenced by its sheer size and confirmed with the author’s note at the end, in which Chee details his exhaustive research. And I do mean exhaustive. I grew fatigued just skimming the list, but I’ve always been a lightweight when it comes to research. When forced to use “outside sources” in class, I’d poke around until I found an article or two that said approximately what I wanted them to say, plug in a few quotes, and call it good. Chee, in contrast, was clearly energized by the minutiae of his chosen topic and eager to incorporate as much of it as he could into his novel. As I read, I appreciated the competent prose but was constantly frustrated by the distance I felt from Lilliet, the enigmatic main character whose secret and scandalous past serves as the basis for an opera. When I finally got to the author’s note, I understood: Chee, in his zeal for historical detail, has written more of a research paper than a novel. So I respected The Queen of the Night more than I liked it. I think there is an audience for it, the kind of people who like an academic and rigorous read, who will enjoy it very much. But I’m relieved to move on to something else—lighter, with perhaps a bit less French. With regards to Houghton Mifflin Harcourt and NetGalley for the advance copy. On sale today, February 2. Can I take a moment to engage in some public self-congratulation? Because I am SO PROUD that I finished this book. 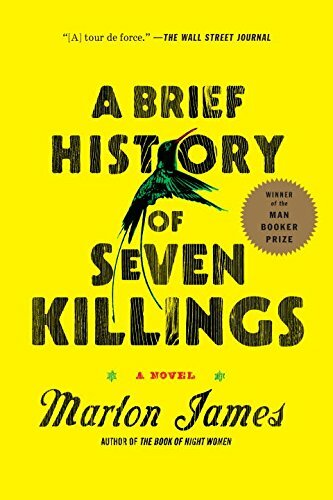 In case you’ve been living under a rock, A Brief History of Seven Killings is about the attempted assassination of Bob Marley in the late ‘70s. Well, it’s kind of about that. That’s the event around which the book centers, and everything spirals out crazily from there. It’s about the drug trade, politics, Kingston ghettos, personal escape and reinvention, and people who suffer violence becoming violent themselves. It’s big and ambitious and explicit and devastating and very, very occasionally hopeful. And man, is it a challenge. First of all, it’s long. 688 pages in print, or if you’re crazy like me, 26 hours of audio. You could literally listen to it for an ENTIRE DAY and it still wouldn’t be over. Secondly, it’s got more narrators than you can shake a stick at. Keeping track of all the disparate voices as they’re introduced is like ducking under continuous cannon fire. In the beginning, the chapters are short enough I’d barely grasped onto the coattails of the current character before he ran out of my reach and I was presented with someone new to chase after. And finally, the many sections written in Jamaican patois were hard to parse until I got used to the rhythm and slang. In the middle of the book, the action gets thick and the chapters get long. I was losing steam, switching over to podcasts in the mornings and avoiding my Audible app. Sometimes I don’t want to hear about drug trafficking and violent deaths as I’m putting on my eyeliner. I thought, maybe there’s no shame in quitting. I tried, right? Moving on to something less demanding was sounding better and better. Marlon James is a deserving prizewinner. I'm a better citizen of this world for having read his book, and I'm heartened that the awards recognition will bring him a bigger audience.